Unusual or interesting bee behaviour. Orienting Bees or Swarmy Bees? My one and only hive that I might be able to steal honey from this year. Door #1: Orientation flights (after being stuck inside for a day and a half). Door #2: A swarm on the way. I pick Door #1. I also pick Door #3 if the bees are making lots of honey behind that door. 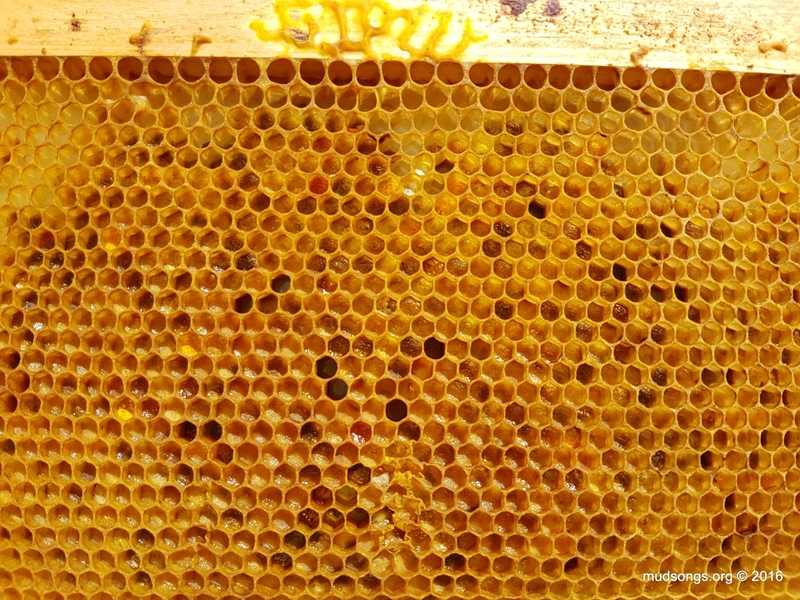 I also removed three frames of brood from the top deep about ten days ago and replaced them with empty drawn comb. I also pulled out a heavy frame of pollen from the bottom deep, one of several heavy frames that I found, and replaced it with a foundationless frame. And that’s why I’m not too concerned about this colony swarming any time soon, despite the fairly large number of bees floating around the front of the hive in the first video clip. 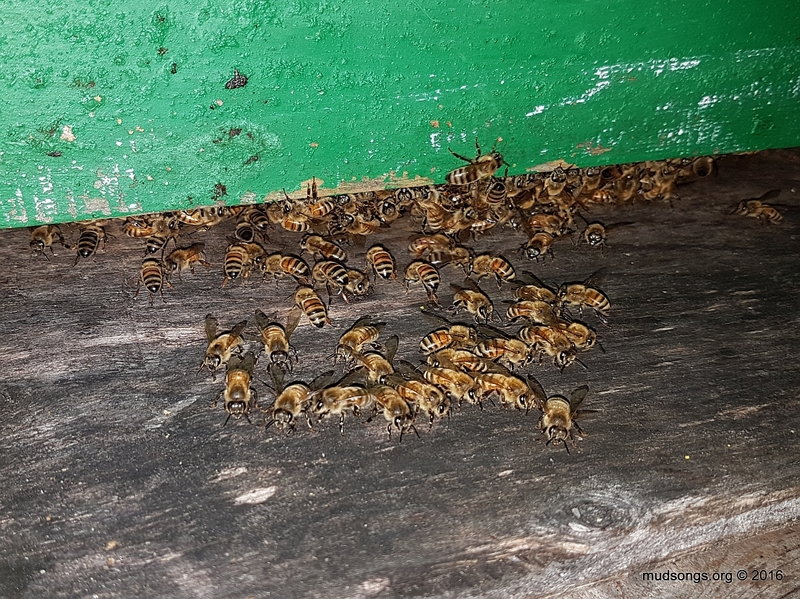 Removing the frames of brood reduced the number of bees in the hive, thus relieving congestion, giving the queen’s pheromones more room to flow around the hive and make everybody happy. Replacing the frames with empty drawn comb gave the queen room to lay, which is pretty much always a good thing. The foundationless frame in the bottom box gave the bees space to fill in, not just a blank frame of foundation, but actual empty space that they will be compelled to fill in to maintain the wonderful bee space that dictates the design of the best beehives all over the world. Building comb to fill in that space instead of building swarms cells — that’s what I want to see. Thus, I’m not concerned about swarming. My plan is to leave this hive alone until the fall when I remove the honey supers. I may take a peek at some of the honey frames once in a while to see how they’re coming along, but the brood nest will be left untouched. 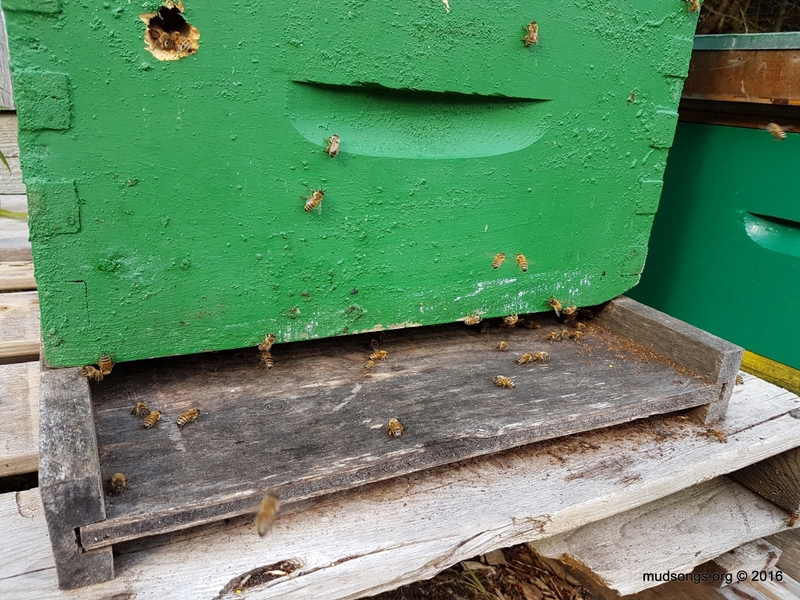 By the fall, the will have made two medium supers full of honey for me and will have enough honey in the brood chamber for themselves to stay alive all winter. That’s what I call good beekeeping… if it works. Bee sting wrapped in a pad soaked in Witch Hazel. They’re sold under the brand name Tucks, but also generically as “personal cleansing pads.” Under whatever name, the magic ingredient is Witch Hazel, which can also be purchased at the drug store in a little bottle, though I find the pads more convenient. The Witch Hazel helps reduce the swelling. 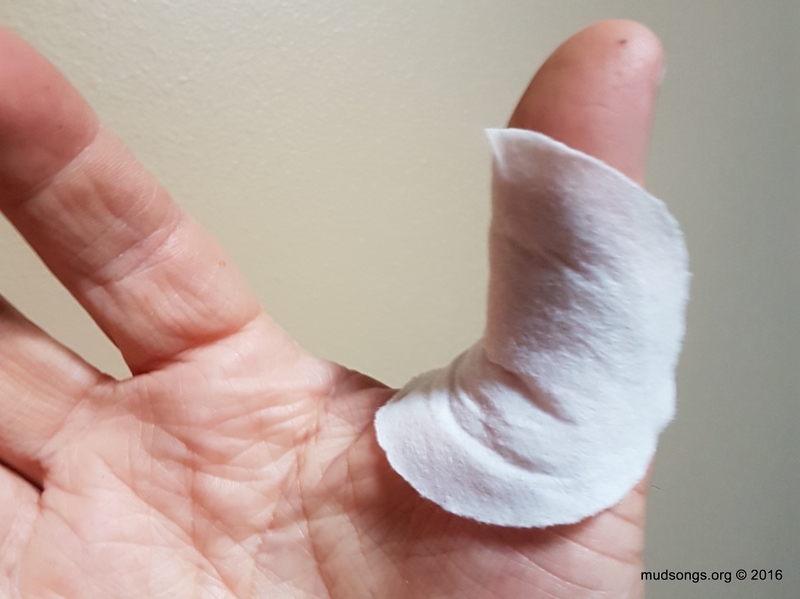 I use a few pads to soak the stinged area and then a final fully-medicated pad to wrap around the area. It’s not a cure-all. Nothing is. But it works good enough for me. It certainly takes the edge off. Why Do Some Colonies Ignore the Bottom Entrance? All of my honey bee colonies this year seem to ignore the bottom entrances to their hives. Here are some photos I just took of one of my colonies — my one and only colony that I think is in good shape — where the bees often fumble over each other trying get in through the top entrance. …pretty much ignoring the bottom entrance. You can see I even use a deep with an extra entrance hole to entice the bees to use a lower entrance. But nope. They pretty much ignore the hole too. I’ve done a lot of reading and I’ve talked to several beekeepers and I honestly don’t know who or what to believe. I’m not too concerned about it. My guess is my usual guess about this type of thing: The bees will do whatever they need to do whenever they need to do it. They know what they’re doing — even if I don’t. And as long as they’re not preparing to swarm, I’m totally cool with it. Nonetheless, does anyone reading this have any ideas? Most new beekeepers on the island of Newfoundland (and many other places on the planet) will start up their first colonies with what is often referred to as a nuc, or a nucleus colony, or a starter hive that contains a laying queen, at least one frame of brood, a frame or two of pollen and honey, and usually a blank or empty frame to give the worker bees something to work on while they’re stuck in a 4-frame nuc box for up to a week. 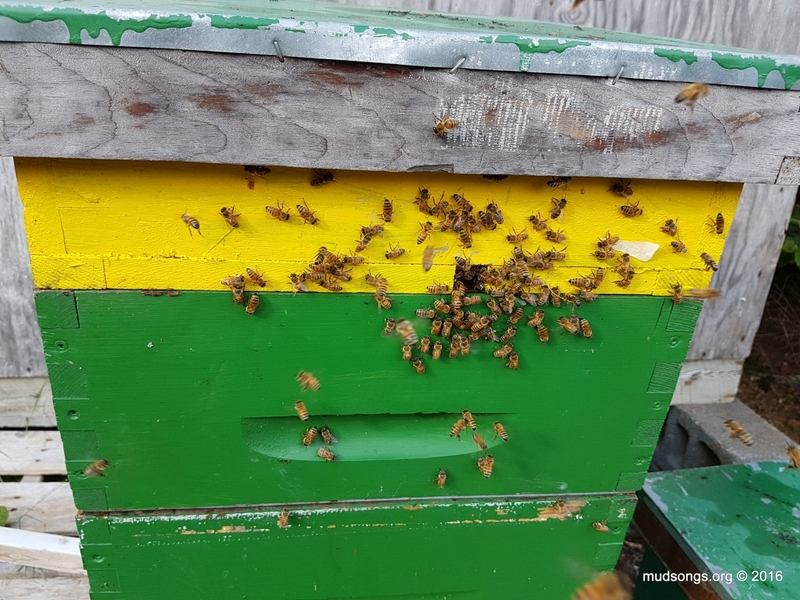 The frames from the nuc are usually placed inside a single hive body (in Newfoundland, it’s usually a deep) with empty frames to fill in the rest of the box. A feeder of some sort is installed. And that’s it. The following 24-minute video demonstrates the entire process. I’ll post a condensed version of this video at a later date, but for now it’s probably more helpful to show how it plays out in real time (more or less) so that anyone new to all this, or anyone thinking about starting up a few honey bee colonies next year, will have a realistic idea of what to expect when it comes time to install their first nuc. I plan to post follow-up videos to track the progress of this colony right into next spring, again so that anyone hoping to start up their own hives in the future will have a non-idealized take on what to expect. It was well over 30°C (86°F) by the time I finished installing all of my nucs. The sweat was pouring off my face and stinging my eyes. Expect that too. I found several frames of pollen in the honey super of one of my hives today. One of several medium frames full of pollen in a honey super. (July 09, 2016.) Click the image for a better view. At first I thought, “Okay, I’ve got another crazy colony on my hands.” Which seems to fit because the bees in this colony are, unfortunately, related to Old Nasty. Their queen mated with drones from the nasty hive. But that’s just speculation, me making up some stuff that sounds like it could be true but probably isn’t when you get right down to it. The bees are filling the honey super with pollen because they don’t have enough brood to eat up all the pollen that’s coming in.